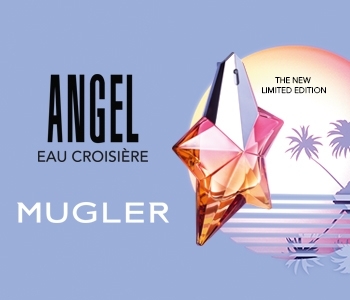 For two decades,Mugler's masterpiece Angel has entranced a generation of women and encouraged them to indulge in the emotions of their childhood. Tenderness meets with a sense of dreamlike infinity. A seduction of angelic flavours found deep within the heart of our memories, as well as sensual and passionate notes. An ethereal blend of Melon, Mandarin, Cassia and Jasmine, with a heart of Honey, Summer Fruits, Blackberry, Orchid and Jasmine. An almost edible base of Tonka Bean, Patchouli, Vanilla, Dark Chocolate and Caramel melt into the skin, delectable and mesmerising.